Today Christina and I are celebrating our 13th year together. 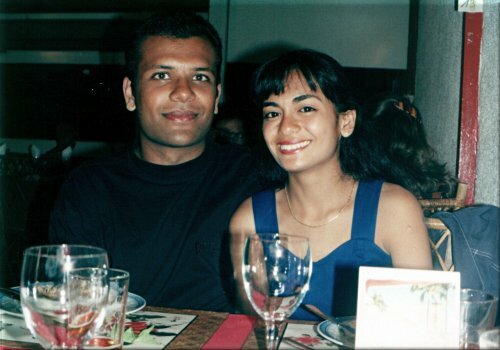 We met on 11 September 1994 at the university of Réunion Island. I was in 2nd year studying Sciences et Structures de la Matière (aka Maths and Physics) and Christina was starting her first year in Lettres Modernes. This photo was taken on my 21st birthday in a restaurant in Saint-Denis on the 25th of September 1994. After about one year, we moved to Lyon in France where I finished my studies in Computer Science while she did a Masters in Information and Communications. We returned to Mauritius in 1998 and started working in January 1999. We managed to save a little bit of money and we got married in January 2000. By that time, Christina was already working at the University of Mauritius while I was working at the Mauritius Chamber of Commerce & Industry. Anya was born in 2002 shortly followed by Kyan in 2004. I joined the University of Mauritius shortly after. Today, Anya is 5 years old and she is going to start primary school in a few months. Kyan is a strong 3 years old boy. Christina and I feel exactly the same as we felt in 1994. We might be a little older physically but we have not changed a lot in our heads… That’s cool! Happy Anniversary, Christina & Avinash! You pointed on something EXTREMELY important: you DID NOT CHANGE IN YOUR HEADS. All the best to you four and to those who stood by you in all this. hahahaha, you look weird with hair on your head! and you look like kids!!! Hope there are many many more happy years to come for your lot ;). Awwwww..your love for each other increases exponentially. You’re a cute couple and shall enjoy an infinite number of years of happiness. Blessed all of you. Sir, you need a wig. You’d look great! Just kidding. Guys, let’s wish this marvelous couple well. You look both beautiful in that picture guys. Wish u all a happy anniversary.The best way to live is to live and enjoy the present fully everyday and to progress towards a common goal. Happy Anniversary toy you too! hmm success story in love, you must be looking back at your life and seeing everything rosy i suppose? Almost hearing a slow music in the background? tell me has those 13 years passed really fast with all the ups and downs of the everyday life…? half way towards the Silver Jubilee..
if 25 years is silver, wats 13?? ruby?? bein koi, it was too funny seeing avinash meetoo not bald! Great photo!! Happy belated anniversary mate! Besides…is that you on the photo?? It would have difficult to recognise you given that there are many differences between then and now…its amazing how 13 years can change a person…even i wondered how will i look later. People may change physically but the soul stays the same. Wish you both a very Happy Anniversary.!!!! Happy anniversary. When I first saw the picture I decided to comment on the haircut :-). I see that others have preceded me on that. I’m currently in UK since 3 weeks so “forgot” to visit your blog. Best wishes for the next 50 years to you two. To iterate is human, to recurse is divine! Were you recursing?